Everybody loves to have fun, and preferably at a real, live and wild carnival. Making this possible is the Wilbur’s Wild Wonderland online slot. This slot has five reels, three rows and a total of twenty paylines. You can play and check out this slot without being required to download anything and depending on personal preference players can either play for free or with real money. The featured graphics are colourful and fun, but unexceptional. The bonuses are varied, and pleasing, while the minimum and maximum bet amounts are set at 0.20 and 500.00 respectively. Read on and see just what other wild fun this slot has to offer. 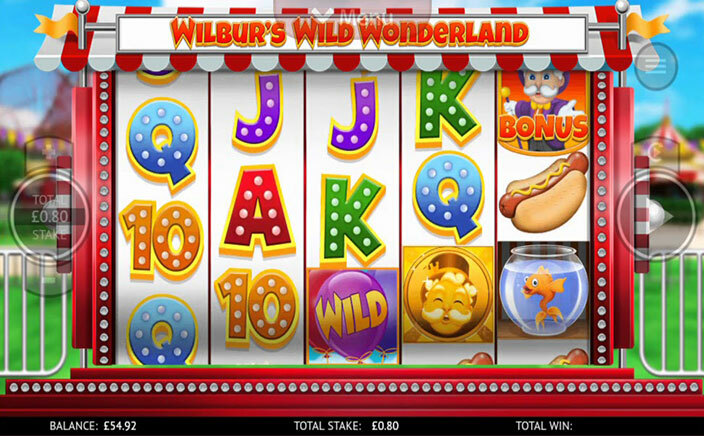 In keeping with the theme of Wilbur’s Wild Wonderland, the audio effects on this slot are just the sort of stuff you might hear at a carnival. Should a win be accomplished, the audio gets cranked up, till you might feel like dancing. While dramatic the sound effects might not be to everyone’s taste. If the audio is not one that appeals to you, there’s an option available to mute it and play in sweet silence. Huge amounts can be won by simply matching any 2 of a particular symbol, or from 3-5 of other featured symbols. Present in this slot is the goldfish icon, a gold magician icon, popcorn, a hotdog, a rubber duck, card symbols, a wild and bonus icon, with each icon being of course beautifully crafted. For each particular icon, there are different rewards for each payline win. The spin graphics can also be tweaked as per player preference. To do this, a total of four options are featured. This includes Caterpillar (3x rotating wilds), Ferris wheel (3x stacked wilds), Carousel (3x rotating wilds), and Teacups (4x whirling wilds). Each of the above comes with varied bonuses and paylines. Before this slot can be played, the player has to choose the particular theme that most tickles his/her fancy. Then the bet amount is picked and should the player land 2-3 of the same symbols on a payline, huge rewards are up for grabs. The RTP stands at 95.00% while the maximum payout is at 250,000.00 coins per spin. 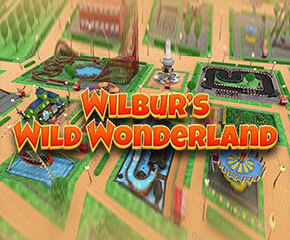 Wilbur’s Wild Wonderland is fun, cool, charming, creative and addictive. It looks good and plays sweetly, offers a quite reasonable RTP, has great bonus features and is overall totally worth diving into and gleefully exploring.